Do you need garage clearance Leyton E10? 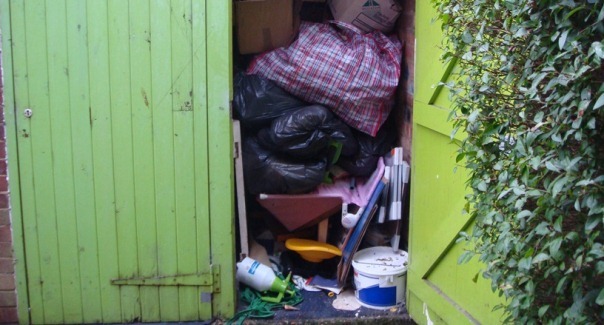 If your garage looks like this we can help! We supply garage clearance Leyton property owner regularly rate highly and are happy to endorse. They really like us for our quick, flexible service and competitive prices. We think you definitely will too! Your garage area is overflowing with old junk you’ve accumulated over many years. You have to leave your car out on the drive or the street in all seasons simply because there’s no space for it in the garage. You want to reclaim your garage space and put it to more productive use. You’re moving house and can’t face taking all your garage junk with you. Whatever your reasons for needing Leyton garage clearance, we can guarantee you quick and versatile service at a reasonable price. Construction waste such as wood, glass, tiles, cabling etc. We are licensed waste carriers. 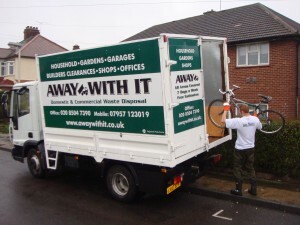 You can rely upon us to perform an entirely professional job and dispose of all your waste responsibly and lawfully. We offer quick, same day collection services. When ever you need us we are only a phone call away. Booking is in two hour slots and we’ll always call ahead of time to let you know when to expect us. So you won’t be left hanging around and can get on with your day. Our straightforward pricing means there won’t be any nasty shocks when the job is done. The rate we quote is the price you will pay without any hidden additions. To talk with a member of our experienced team about your needs for garage clearance Leyton just give us a ring on 0208 504 7390 or 07957 123019. We’re here 7 days a week to answer your call and will gladly respond to any concerns and offer a very competitive price estimate that’s inclusive of all labour, transportation and transfer fees. Alternatively, provide your information using our online enquiry form and we’ll get back to you promptly.